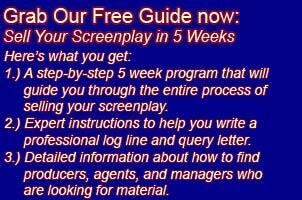 Many new writers feel helpless because they don’t know where or how to submit their script. I know for myself, I never had the motivation to write anything until I had some idea about who to send it to. This article will help you build your own database of industry connections. I actually got my start by sending out query letters using a Writer’s Digest book called Writer’s Market. In some ways I owe my screenwriting career to this book. In college, I had a class that met in the library. One day I arrived early to class and the classroom door was locked. So I wandered across the hallway and went into the poetry reading room. There I found the Writer’s Market and noticed the section geared towards screenwriters. I picked a few and started submitting. While I didn’t get a positive response to my poorly written query letter, it was enough to get me writing and learning. You can read more about my story on my Welcome page. This book still exists and it has a small section where it lists production companies who will accept material from new writers. I’ve found this list to be pretty good. It’s not a huge list of companies, but the companies listed are usually more open to unsolicited material than other lists you’ll find. So if you want a nice little list to begin your marketing efforts I highly recommend this one. I can almost guarantee that if you have a solid log line and a professional query letter and you submit to their entire list you will get at least a few companies requesting your screenplay. You can buy the Writer’s Market at Amazon.com by clicking here. You can probably find this book at your local public library, too, if you’re on a budget. Another great source of data is The Hollywood Creative Directory. I hesitate to mention this company at this time because it appears as though they’ve gone out of business. But you can still buy many of their directories. In their directories they list every company in the entertainment business and their listings usually have a name, address, and phone number and sometimes a fax number and email address, too. They have several versions. The main one has production company information but they also have an “Agents and Managers” version if you want to query agents and managers. These directories are by far the most comprehensive and easiest to use listings in the entertainment industry. I’ve had my biggest successes over the years submitting cold query letters to these companies. So it’s a shame that they’ve gone out of business. The good news is that as of this writing (May 2012) the directories are still available for purchase. You can buy them from Amazon.com by clicking here. I think one of the reasons that The Hollywood Creative Directory has gone out of business is because of IMDBPro.com. While IMDBPro isn’t as easy to use, it actually seems to have more data than the HCD did. So going forward this is probably your best alternative. It’s a bit pricey and has a monthly recurring charge, but it you’re strapped for cash you can sign up for their free trial and cancel before they bill you. Just make sure you really use it during that free trial period. What you’re going to want to do on IMDBPro is simply start clicking around on film titles and drilling down to the companies who made these films and copying and pasting their contact information into your own spreadsheet. Or clicking on specific names and drilling down to find their agent or manager contact information. While this can take a bit of time, once you’ve put these companies information into your own spreadsheet you’re going to be able to contact them over and over again with all of your scripts. You might even consider partnering with another writer and dividing the work up and then combining your lists. A great free resource for building your database of writer’s agents is the WGA West list of signatory agents. It can be found here: http://www.wga.org/agency/agencylist.aspx. It only lists company names, addresses and phone numbers. If you drill down into IMDBPro, however, you can find actual agents names, fax numbers, and even sometimes emails, too. So in combination with IMDBPro the WGA list can be quite useful. The WGA list, however, is going to be the hardest list to crack. These companies already have lots of clients and they’re not going to want to read material from new writers in most cases. I have been able to get my scripts to some agents from this list, so it is possible, but it’s not going to be easy. There are probably other listings that I don’t know about so keep your eyes open. If you find another source of this sort of information please let me know as I’m always looking to build and update my own database. I’ve also had some success submitting query letters to production companies who advertise that they’re looking for screenplays. So don’t underestimate these sorts of listings. These listings used to be found in the back of trade journals like Variety but seem to be listed now on various websites like Craig’s List. Check out my post: Submitting your screenplay to Craig’s List postings. In fact, the first screenplay I ever optioned and sold, Dish Dogs, was actually the result of submitting to an ad that I found in the back of one of the trade magazines. The producers who advertise online like this are usually looking for smaller, indy type films so if that’s the type of film you have keep an eye on these sorts of listings. Keep in mind, this list is just my list, it’s not an exhaustive list. So always keep looking for new opportunities where you can submit your screenplay. Recently I had a writer email me who said he had optioned a script by networking on Twitter and Facebook. He wrote a guest post on my blog which you can read here: Networking Online – How One Screenwriter Optioned His Screenplay By Networking Online. I offer an email / fax blast service where all you have to do is provide a query letter and I send it to my database of contacts. I’ve spent many hours compiling my database just as I outline above. So if you don’t want to spend time building your own database, you might consider giving my service a try. But keep in mind, my service isn’t anything you can’t do on your own if you’re willing to spend the time. To learn more about my email / fax blast service go here: Query letter submission service.